Do you like skiing? Have I got a place for you. What about water sports like boating or water skiing? This is the perfect place. Are you an outdoors person who's into hiking and camping? We've got plenty of that. 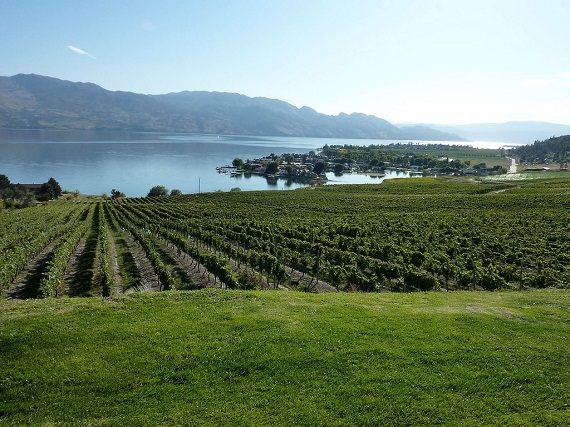 How about a glass of amazing wine straight from some of the top wineries in North America? A number of them are located right here. What if none of that really appeals to you? Well that would make you me (or a reasonable facsimile thereof). Congratulations on being so good looking! To those of us for whom skiing, boating, camping and fine wines hold no interest (Man it sounds really bad when you say it like that! ), Kelowna is still a beautiful place to live. A city built on the side of a lake with giant mountains towering up over it is one of those picturesque settings you usually find in movies, and on the right day, Kelowna can look like a movie set. Sure at 2am when the bars let out that set would be Night of the Living Dead, but the other 23 hours a day it looks more like you took Vancouver and relocated it to a National Park. Yeah, it's that kind of pretty. That should probably be enough to explain why people flock here on vacation (although it would make for a really short series of posts) but I think we're going to need to do a little more digging. After all, it's a city of 100,000 people which almost doubles during the summer months. That's a lot of extra people who come here every year, and they can't all be searching for our elusive monster of the lake (Seriously guys...how hard can he be to find? He's on Twitter - @TheOgopogo). They've got to be doing something while they're here, so I'm going to do the dirty work for you. You want boating information? I can get that for you. You need to know which wineries are worth visiting? I'll go check it out. You want help planning a hiking and camping trip? I'll find somebody to write a guest post for me (I've already learned that lesson). Saturdays from now on are dedicated to exploring Kelowna. If you live here or know the area well, and have a suggestion for something I should check out, let me know. I'm looking for all those things that I've overlooked in the 13+ years that I've lived here (and if you remember my New Years resolution, you'll recall that I overlook a lot). I want to find out what all these people who visit Kelowna have found that I've been missing. I'm hoping it's ice cream, but whatever it is, I want to know about it. If you want to know about it too, or just want to find out what happens when I actually go outdoors, then come back next Saturday and we'll start to look around. Ummm...wait! Please keep coming back the rest of the week too. I really do appreciate it.